Physical Weight 3.6 LBS. 3.1 LBS. Brace Height 6 1/2" 7"
So what you see from this is that the two compound bows are practically identical in terms of stats. Same draw weights, same top speeds, same let offs, the axle distance is only 1 inch of difference, physical weight and even the prices are similar. Performance wise they are basically the same bow. The axle difference means the Bear is about 3% more forgiving, but the Diamond has 3% more maneuverability in thick brush. So Pros and Cons. The Bear Cruzer has 1 inch extra in terms of minimum draw length, but that will only matter to you if you if the bow is for a really, really small person. eg. I just measured and my son has a 10 inch draw and he is less than 4 months old. The Diamond Infinite Edge was designed to be a bow that was perfect for beginners of all ages, and a broad range of draw lengths / draw weights. As a result of such adjustibility, the Infinite Edge became a huge commercial success. The Bear Cruzer is basically just a copy. In an effort to capitalize on the commercial success of the Infinite Edge, Bear came out with the Cruzer model and to my knowledge, it has been commercially successful. The Prism - With a higher let off and lower max weight. The Atomic - Designed specifically for children. Basically, Diamond has been gearing part of their marketing strategy towards children, teenagers and beginners. 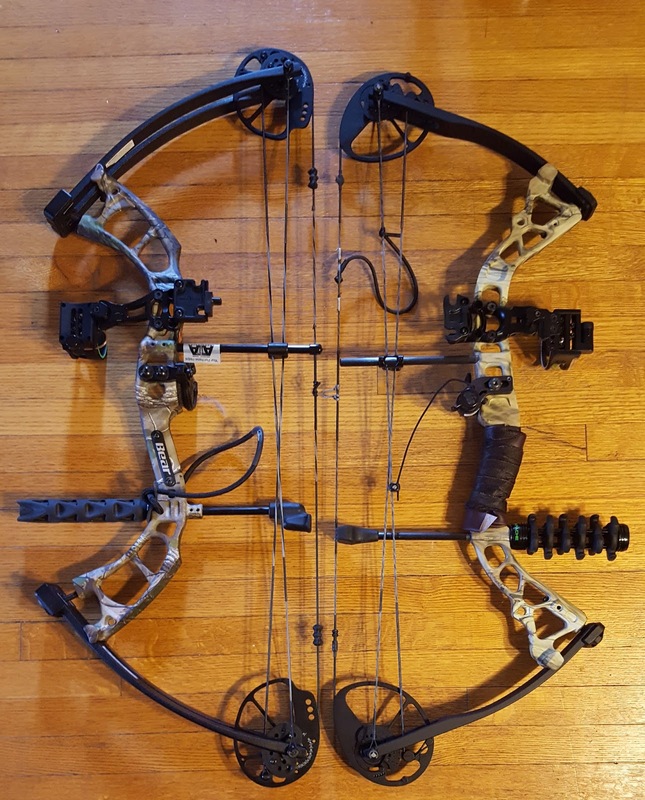 They still make plenty of other bows specifically for adults (as does their parent company Bowtech), but they have made huge inroads with respect to growing a clientele amongst children and teenagers. And the fact that Bear Archery Co. is copying them shows that there is a lot of money to be made. Back in 2014 I bought a Diamond Infinite Edge (mine is shown below, which I refer to as "Burnt Rubber") shortly after it first came out. 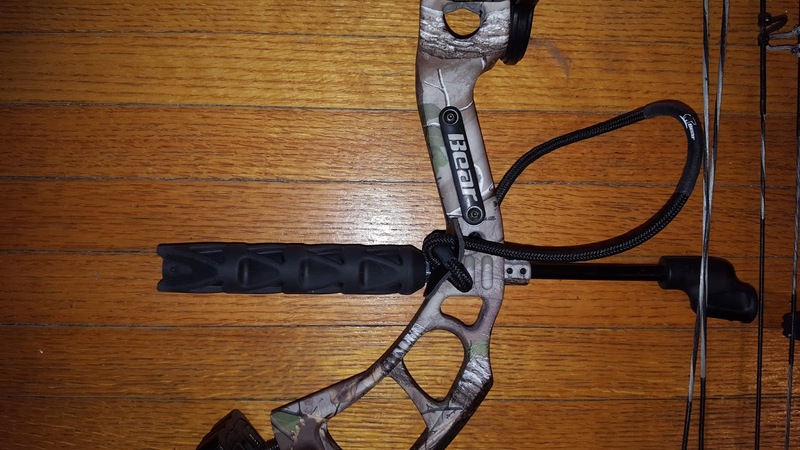 I chose it because I wanted a compound bow that was super adjustable, easy to adjust, and I wouldn't need a bow press at all. I later used that same bow to take 2nd place in a compound bow archery competition in 2016, beating people who had more expensive bows than I did, and I nearly took first place but screwed up in one round which severely hurt my score - which only goes to show you that it is the archer, not the bow, which matters the most. With respect to Bear, I have a great love and admiration for the company. 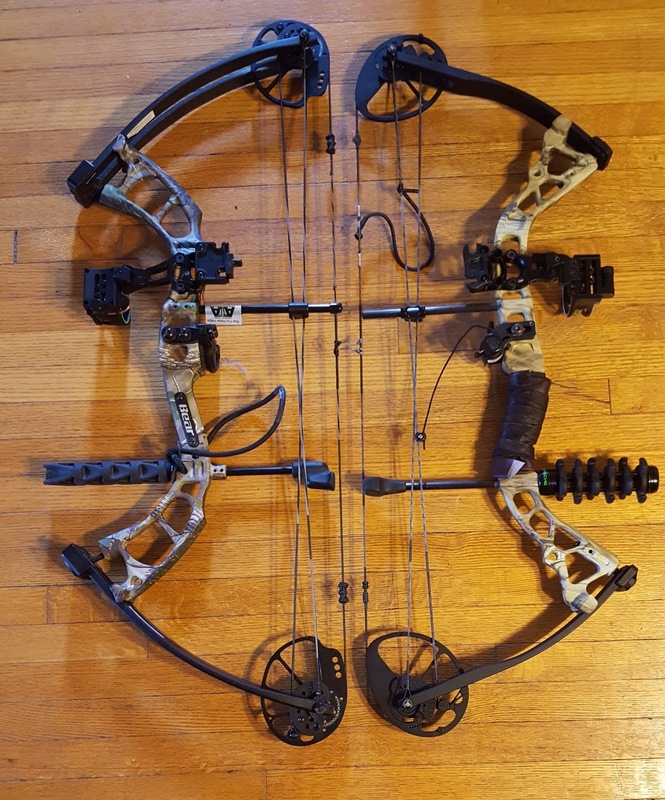 They have a great reputation, great warranties, and I own two Bear recurve bows. Next, lets compare them visually. You can easily tell the Bear Cruzer is slightly longer, axle to axle. Pros and Cons to that. Different Cam Shapes, but still similar in some respects. For legal reasons they should not be identical. The stabilizer that came with the Cruzer vs the NAP Apache stabilizer I added to mine. The sight that came with the Cruzer vs the Trophy Ridge sight I added to mine. 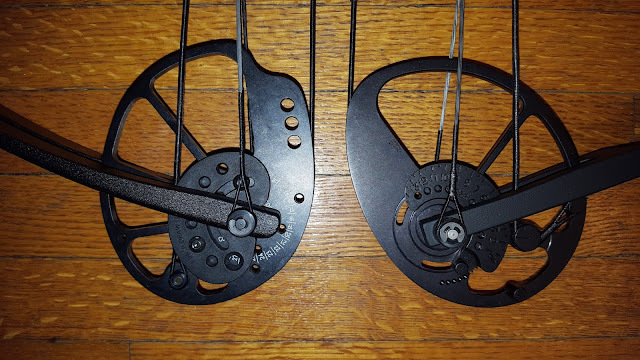 The arrow rests are a Whisker Biscuit vs a QAD drop away arrow rest. The peep sight ripped off the Bear Cruzer (client said they would fix that themselves), vs my peep sight which has been reinforced with extra serving. I am a firm believer in reinforcing the peep sight so it doesn't move around much. The two bows side by side, once more. 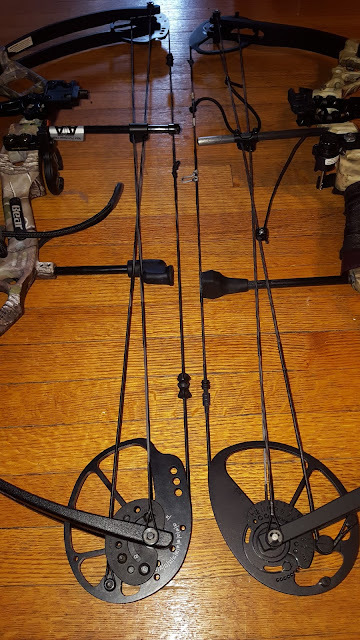 In case you are curious, the client requested their bow be set to 29 lbs. Mine is set to 55 lbs. With respect to my bow you can see it has been heavily modified. 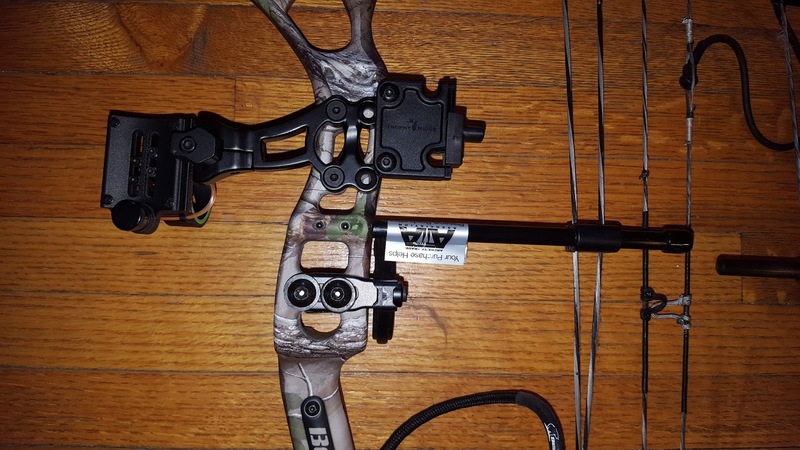 New QAD drop away arrow rest. Reinforced the peep sight with extra serving. Wrapped the handle with pleather for extra comfort. Not shown here, but I also got a nicer side quiver for it. I don't need a wrist sling. I am not in the habit of dropping my bows. I do fully endorse people to modify their bows however. 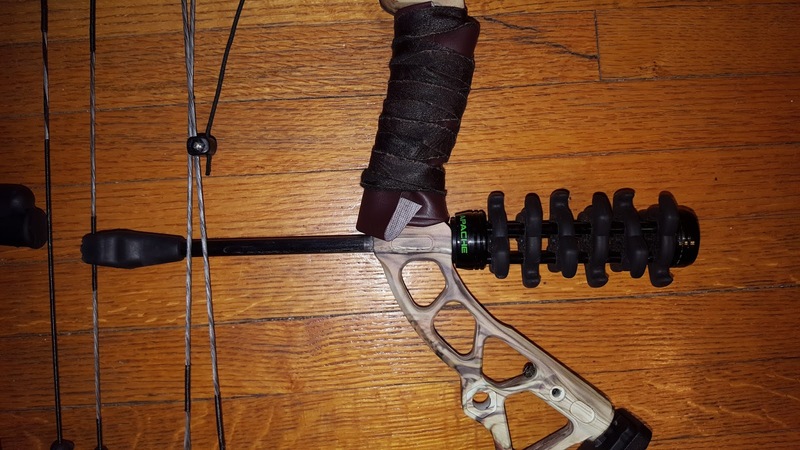 The stabilizers, sights, etc that come with a compound bow straight out of the package are never the best. They are pretty "basic". They will work more or less, but they will never work as good as the mid range or higher end equipment that is available. Take the Whisker Biscuit for example. It is okay. It works. But you will never get the same kind of accuracy that you can potentially get with a drop away style arrow rest. 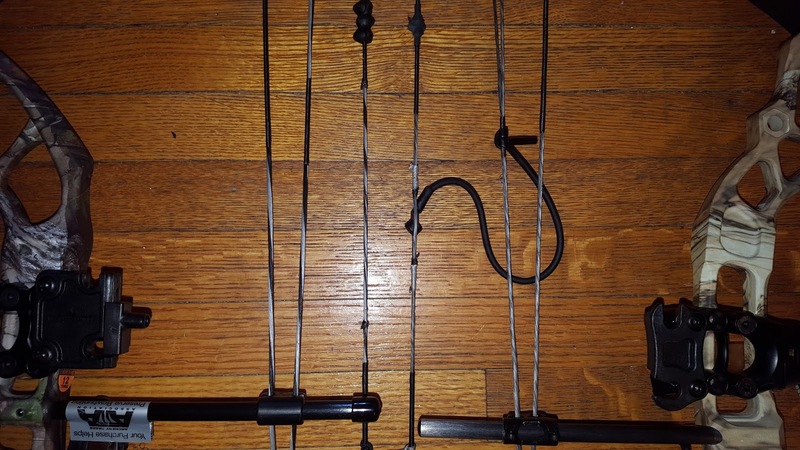 Honestly, the two bows are so similar that the biggest differences will depend on what you decide to do with it. Modify it? I fully recommend doing that. These days you cannot even get a new Diamond Infinite Edge. You have to get the Pro version, the SB-1 version or some other similar model. The original "classic" model is no longer available. I do have one issue with mine... Every time I shoot it there is a faint whiff of burnt rubber. Hence why I gave it the name "Burnt Rubber". I also fully endorse giving your bow a name. Any good bow deserves a name. PS. 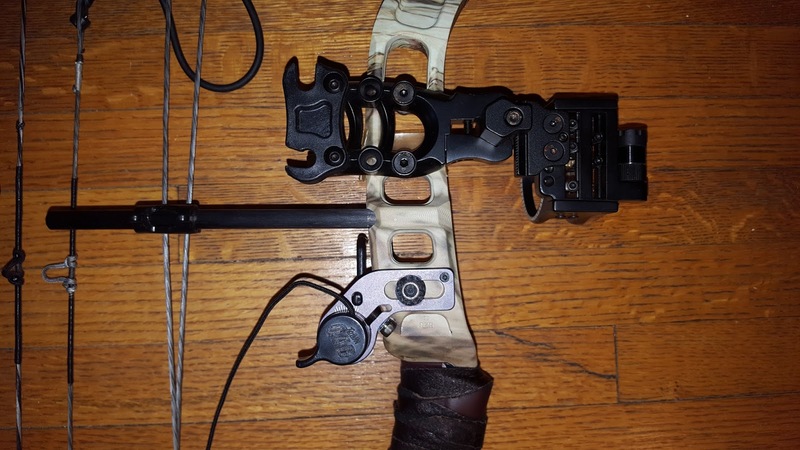 If you are looking for compound bow repairs in Toronto, talk to me. If you compare my rates to other locations, you will find I offer the best rates on all repairs.